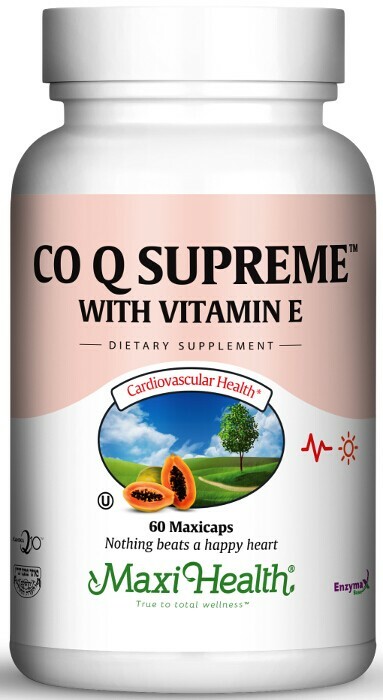 CO Q Supreme™ is a unique combination of antioxidants that contains Co Q 10 and Natural Vitamin E.
Co Q 10 is a fat-soluble vitamin-like substance found naturally in all forms of animal life. It is biosynthesized in the membranes of cells in humans and is vital in the production of energy. It is found in most cells, with especially high concentration in the heart (the organ that requires high levels of energy for normal operation). We use Natural Vitamin E (d-alpha tocopheryl succinate). It’s found to be superior in absorption to the synthetic forms (dl type) and its respective acetates. Try CO Q Supreme™ today! Take one (1) Maxicap™ once or twice daily with meals, or as directed. Other Ingredients: Microcrystalline cellulose, vegetable cellulose, magnesium stearate, silicon dioxide, Enzymax® (calcium carbonate, bromelain, papain, lipase, amylase, protease, silica). Kaneka Q10™ is a trademark of Kaneka Corporation.